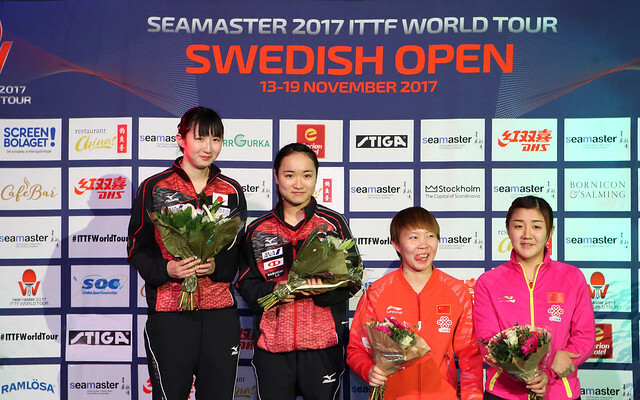 The penultimate day of the Seamaster 2017 ITTF World Tour Swedish Open is here and players left standing in Stockholm are ready to give it their all as the race to reach the gold medal matches in the two singles events intensifies. Take a look at what's coming up on Saturday 18th November. Victorious at the recent Seamaster 2017 ITTF World Tour Platinum German Open, Chen Meng is aiming to appear in her second Women’s Singles final in the space of a week, a goal the world no.2 will achieve with favourable results on day three of the competition in Sweden. Awaiting Chen Meng in the quarter-finals is fellow Chinese representative Chen Xingtong, who heads into the match off the back of positive display against Hu Melek in the previous round. The victor will be rewarded with a spot in the last four where either Zhu Yuling or Miu Hirano, seeded second and fifth respectively, will provide the opposition. Spectators could also be set to witness an exciting duel in the top half of the semi-finals draw as China’s Ding Ning and Japan’s Kasumi Ishikawa do battle. The two met earlier this year at the Liebherr 2017 World Championships hosted in Düsseldorf. Ding Ning came out on top on that occasion but can Kasumi Ishikawa cause an upset by reversing that outcome in Stockholm? Lin Gaoyuan is the only player competing in the Men’s Singles category who is yet to drop a game at the 2017 Swedish Open, but will that record remain intact by the conclusion of Saturday’s action? Quarter-finals opponent and fellow countryman Zhou Yu will not only attempt to end Lin Gaoyuan’s perfect record but will also be looking to condemn the fourth seed to elimination in the process. Fighting at the very top of the draw is another Chinese star Fan Zhendong, who will need to approach his match against Quadri Aruna with caution. The Nigerian competitor has been in terrific form in the Men’s Singles event, but can he register what would be the biggest shock of the tournament so far by prevailing over the top seed on day three? Denmark’s Jonathan Groth is another contestant who has enjoyed an impressive outing in Stockholm and will face second seed Xu Xin for a spot in the penultimate round where a meeting with one of Koki Niwa or Fang Bo awaits.